The tech sector is embracing the repurposed shipping container industry and we jumped back to our tech roots this past week at MacWorld/iWorld in San Francisco to join them. How does a decade old, low-tech, repurposed shipping container company show up at MacWorld/iWorld? As previous career veterans in the tech sector, we were excited to take part in MacWorld/iWorld 2013. This annual trade exposition for Apple, and all Mac hardware and software vendors supporting the Apple product line, took place January 31-February 2nd in San Francisco, CA. While Falcon Containers was not on the company showcase list, our product, a Modified Repurposed Shipping Container, paved the way for a unique approach to a tradeshow booth. Our client Adonit, an innovative manufacturer of products for the iPad, was in search of a unique, portable, and environmentally friendly tradeshow booth. The idea of the repurposed shipping container came to Kris Perpich, Chief Experience Officer at Adonit, as he began to consider the idea of moving this portable product display and tradeshow booth seamlessly from location to location while keeping a ‘green’ approach to the design. The structure began with a 20-foot conex box and was transformed into an open-sided structure including flat screen panels filling the 20-foot span and space for retail sales inside. Our fabrication team worked with Adonit closely in designing access into the booth and accommodations for fixtures to support the LCD display screens. The idea by Adonit to create a unique space that would make them stand out at MacWorld worked. 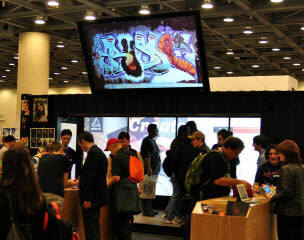 A contributing journalist ranked Adonit among the ‘Coolest Booths at MacWorld/iWorld 2013’. Feedback from attendees and Adonit staff confirmed that the goal of creating an exciting splash at the tradeshow, with the use of a repurposed shipping container as the foundation for their product line, was reached. The black reinforced steel structure came alive with roll-up access doors being added to provide open access and entrance. Inside LCD screens were used as demo platforms for the patented Jot stylus and Writer Bluetooth keyboard that Adonit manufactures for the iPad. While the Falcon Boxperts were not in attendance at MacWorld, our staff was proud to ship off the modified repurposed shipping container for its high tech debut. Our product line of conex boxes are being breathed a second life which allows us to experience and become involved in a variety of uses, industries and product launches. It is with great excitement that we wish our client Adonit success as they showcase their product line across the country in a modified repurposed shipping container. If you're thinking about using a custom shipping container for your business, check out our Custom Conex blog posts or give us a call at 877-704-0177.